to be protected by a security and fire system! Many companies will sell systems at super-low prices and some even advertise that they will install these systems "for free." Many companies do this because the systems they install are what we call a "Smash and Grab" system and because they are super-cheap! A "Smash and Grab" system is one where the whole system is built into one main keypad. The siren, phone dialer, wireless receiver, and everything else are all right there. All a person or group would have to do is open your door, smash your main keypad, and then be free to do whatever they want. Probably more than 80% of systems installed today are that way. The company will certainly tell you that it will send a signal before it is completely smashed. This is simply untrue. The idea for these systems is that they are cheap, and they are easy to install. Unfortunately, they are also very unsafe! Also, interestingly enough, most security systems and brands available today offer an out-dated and aesthetically undesirable product line. Many look as though they were designed in the 50's. Actually, it is a real challenge to find a good system design. Security companies can also offer these already cheap systems for such an appealing price, because they will more than make up for it with an over-priced monitoring contract or when they have to make a service call for something they said was "included." Our company is different! This is not to talk bad about these other companies. For some, it is a seemingly successful model of business. We just have a very different philosophy and business model. At Guardian Media, we can sell and install literally any brand of security products we want, but we want our clients to have the best! We sell and install products that we believe in and that we are proud of! We have sought out product lines that are cost effective, but also that we would be happy to have in our own homes and businesses. Although we have installed and services all major brands of systems, we use DSC Security Products out of Canada. 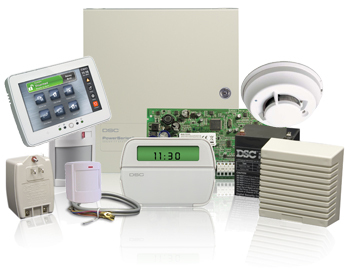 Our most basic systems come with an ultra-sleek keypad, a compact motion detector, two door/window contacts, and everything else needed to connect your system to a standard phone line. Our systems are also completely upgradeable for the future. There are many options available when you are ready to add to your system, including the ability to control your system, heating and cooling, or even electrical appliances remotely. You can also add devices to your system such as smoke detectors, carbon monoxide detectors, glass break detectors, wireless key fobs, etc. Aside from some special promotions, we do not require monitoring on any of our systems. We do, however, believe in the importance of monitoring. There is a fleet of professionals ready to act in case of a fire, medical, or intrusion emergency! We are convinced that you will trust us to protect your family for a lifetime! Give us a call today!! Why should I consider a URC Remote? What's the difference between 720p and 1080p? ASK ABOUT OUR EASY PAYMENT OPTIONS! We know it can be hard to pay a lot of money all at once. At Guardian Media, we want every Hoosier family to be protected! That's why we created easy payment options on all of our security systems. Go ahead and check them out!